Synopsis: A thief who steals corporate secrets through use of dream-sharing technology is given the inverse task of planting an idea into the mind of a CEO. 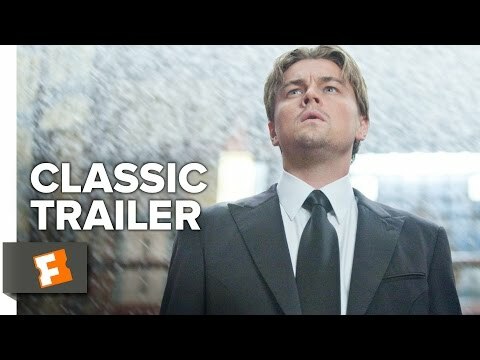 Leonardo DiCaprio plays Cobb, leader of a band of thieves capable of invading a target’s dreams in order to extract information that is valuable to their clients. Other members of Cobb’s band include Arthur (Joseph Gordon-Levitt), Eames (Tom Hardy) and newcomer Ariadne (Ellen Page) who serves as the audience’s surrogate through whom the convoluted mechanics of the practice of extraction are explained. Cobb is a complex, troubled man, haunted in dream scenarios by projections of his dead wife, Mal (Marion Cotillard), whom the authorities in the USA suspect him of murdering. Inception is a curious mixture of cerebral drama and action adventure which is entertaining and frustrating in equal measure. It’s certainly not a movie that reveals all its intricacies with one viewing, and a second viewing is mandatory in order for some to gain even a tenuous grasp on exactly what is going on. This is no bad thing – too often Hollywood feeds us an unending stream of high-concept, low intelligence action blockbusters that insult the intelligence of most viewers, so it’s refreshing to be presented with a piece of work that presents a challenge to all who watch it. Nolan even acknowledges the futility of trying to provide a definitive answer to the mysteries he creates by providing a tantalisingly ambiguous conclusion that nevertheless may leave some viewers feeling cheated. Others will relish the questions Nolan poses – the internet is awash with debates, theories and arguments about every aspect of this movie.